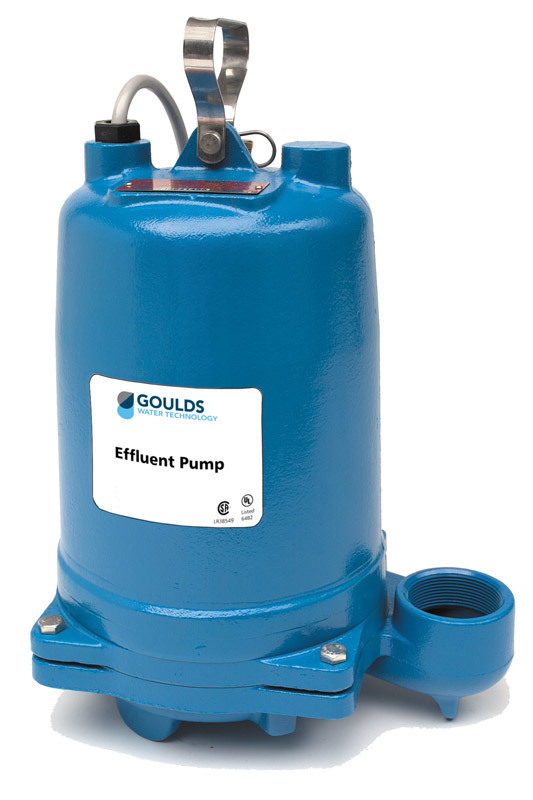 Goulds 3885 Submersible Effluent Pumps is perfect for wastewater residential pumping applications. Customers can rely on this pump due to specifically being built and designed for on site wastewater treatment in residences or homes. More applications are trailers, farms, hotels, motels, schools as well as hospitals. The 3885 WE Series products, perfect for Industry, most of all industrial effluent systems. Residential customers love the performance and worry free operation of these pumps. The Goulds impeller is made of cast iron material and is non clog, semi-open with pop out vanes as a result to protect the mechanical seal. G&L makes the cast iron volute designed for maximum efficiency and comes with a 2″ NPT discharge. Pumps are capable of running dry without damaging components as well as continuous operation even when completely submerged. The 3885 WE Series seals are mechanical seal is made of silicon carbide vs silicon carbide sealing faces. When it comes to stainless steel parts, BUNA-N elastomers are used. Worry free operation is important and the shaft is corrosion resistant stainless steel with a threaded design. There is a lock nut on all pump models to help protect against damage to the components and accidental reverse rotation.